Chess is an exciting game for some people because there is a lot of action involved on the board while non-players just see two people brooding over wooden pieces. This kind of game is universal game and there is no age limit. The pieces in the chess set are always the same. They consist of the king, queen, bishops, knights, rooks and pawns. Normally, these pieces are black and brown, while the chessboard has black and white squares that are alternately arranged. Chess player and chess pieces use this kind of chess for many years. But it doesn't mean that it won't change. We introduce you different color of chess. This kind of chess is very unusual than ordinary chess. As wooden chess manufacturer, always use the best Teak wood as its main material, and now we present the unusual chess pieces for you. 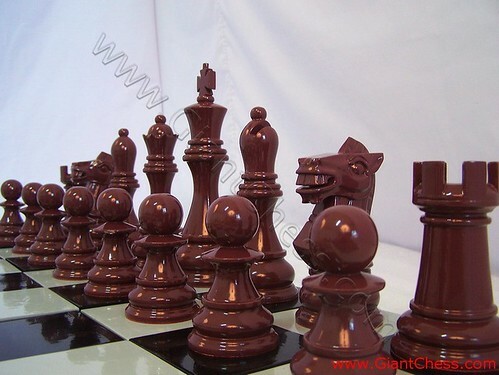 Here we have dark brown chess pieces that very uniqu and pretty standing on its chess board.